The Colt Model 1851 “Navy” Revolverhas typically been thought of a distinctly American pistol, with many of the revolvers seeing service with both the US and CS military during the Civil War, as well as seeing significant civilian service on the frontier. 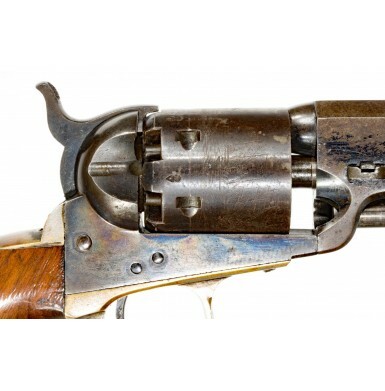 However, most collectors are unaware that the Colt Model 1851 Revolver was the first revolver to be accepted into service and issued by the British military. With the advent of the Crimean War, and the sudden need for modern repeating handguns in the field, the British Ordnance Department placed orders for a total of 23,700 Colt’s “Navy” pistols. These revolvers were delivered between March of 1854 and February of 1856. 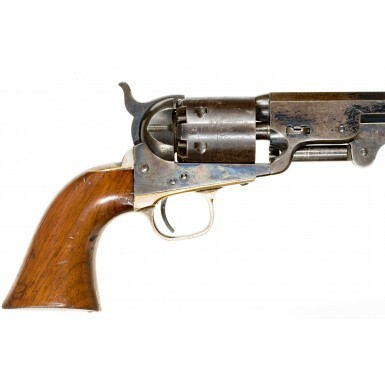 While many of these were delivered from Colt’s London production facility, additional revolvers were delivered from his US manufactory as well. 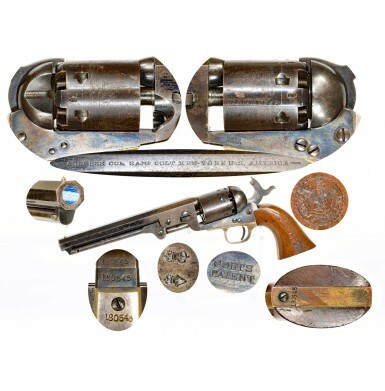 Of these revolvers, 9,600 were issued to the Royal Navy, 5,000 were issued to the army in the Crimea and 9,000 remained in store at the Tower of London as of February 1856. All of these British military purchased revolvers were marked with the usual British proof marks, as well as the royal ownership mark of a small “Broad Arrow” & WD mark. There are no additional records regarding the official purchase of Colt M1851 Navy (or any other Colt revolvers that I am aware of) by the British military during the mid-19thcentury. However, a small group of much later manufacture Colt Navy revolvers are known to exist that bear the British Storekeepers mark from the Royal Small Arms Factory at Enfield on their left grip. This “circle in a circle” roundel cartouche is a well-known British military storekeepers mark and is indication that the firearm so marked was accepted into British military service and placed in inventory for issue. This small group of Colt revolvers was initially identified by author and researcher Nathan Swayze, who authored the seminal book ’51 Colt Navies – The Model 1851 Colt Navy, Its Variations & Markingsin 1967. According to Swayze’s survey and research, there were sixteen known examples of Colt M1851 Navy revolvers that were British proved and marked with the Enfield storekeepers mark on their left grip. All of these revolvers were within the serial number range of 179487 and 188258. This places the production of all of these guns between late 1864 and early 1866; long after the Crimean War had concluded and the British had officially adopted revolvers of British manufacture for service. Swayze did significant research on the matter and corresponded with officials at The Tower of London, The British War Office Inspectorate of Armaments (RSAF) and Master General of the Ordnance Inspectorates (RSAF) all of which could provide no official explanation for these late production Colt Navy revolvers with the RSAF mark. In fact, the best these officials could do was to provide contradictory theories as to the origin of these revolvers. However, British revolver researchers and authors W.H.J. Chamberlain & A.F.W. Taylerson may have inadvertently provided an explanation to this conundrum. According to them, the British military purchased a number of Kerr revolvers on the open market after the conclusion of the American Civil War to help arm troops during the Fenian troubles of 1867 (Ireland & Canada) and the Maori Uprising of 1868 (New Zealand). 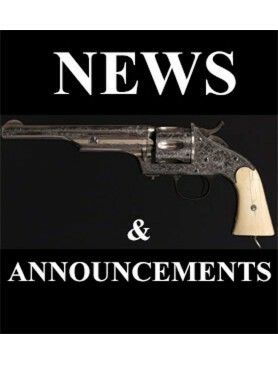 The Kerr revolvers were undelivered pistols that had been produced by the London Armory Company, on contract for the Confederacy, and were never delivered due to the end of the war. Colt was in a similar situation with the cessation of hostilities. They had substantial supplies available and a sudden reduction in demand for their pistols. The British military found themselves an urgent need for revolving pistols and discovered that it was quicker, easier, and likely cheaper, to obtain the needed revolvers on the open market rather than place additional orders with the typical vendors. This explains the handful of Enfield marked Colt Navy revolvers, and also explains their serial number range perfectly – left over revolvers that were unsold from 1864-1866 production. I do not know if Swayze ever made this same determination, or if any additional examples were located in the US. 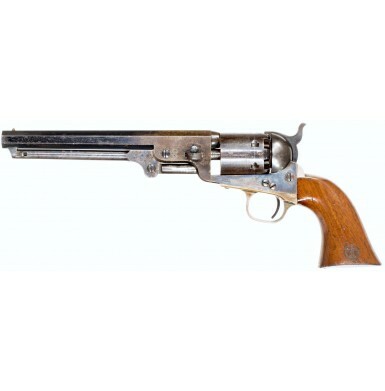 I do know that these revolvers are extremely scarce and are rarely seen on the market for sale. 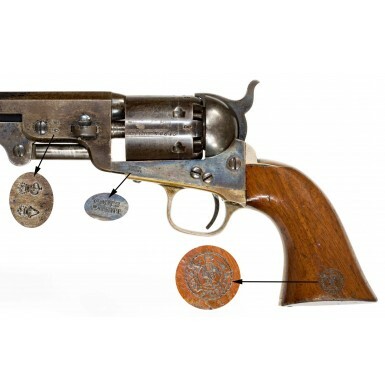 The Enfieldmarked Colt Model 1851 Navy Revolveroffered here is a textbook example of one of these scarce pistols, as described in Swayze’s book. 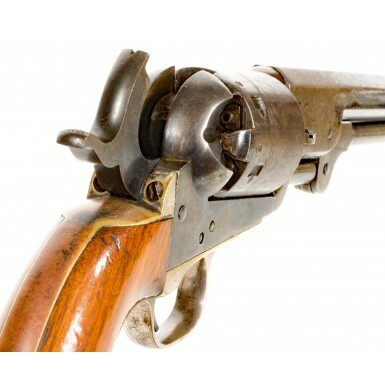 The gun is serial number 180545placing its production in very early 1865. 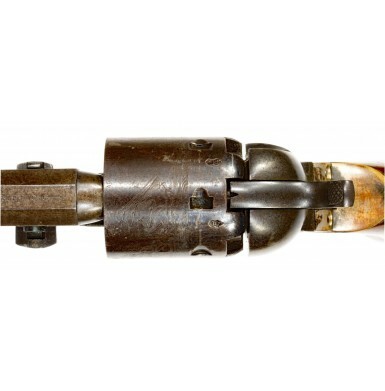 The revolver is all matching, including the wedge, with the exception of the cylinder arbor, which is numbered 0505, which could well be a factory error. It is also worth noting that of the sixteen examples noted by Swayze, several had some mismatched numbers. It is not clear if that was the result of RSAF rebuilding and repair or no. This revolver has an unnumbered loading lever, which is also interesting, as the only other example of one of these very rare guns I have ever owned (more than a decade ago) also had an unnumbered loading lever. 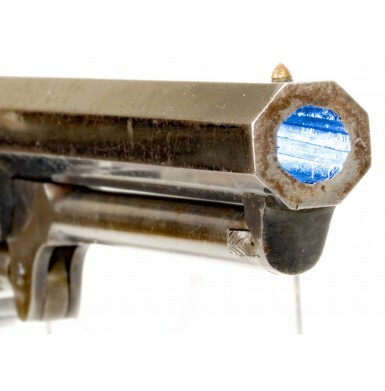 The condition, finish and patina of the loading lever matches the rest of the gun perfectly and it appears to have been with the pistol all of its service life. The frame retains 70%+ vivid casehardened coloring, which has faded and dulled slightly, but still retains wonderful coloring. The lower left side of the frame is clearly stamped in two lines: COLTS / PATENT. The loading lever retains about 50%+ vivid case coloring, mostly on the web at the hinge and the hammer retains about 40% vivid case color, which has a duller, muted overall appearance. The cylinder retains some traces of bright blue, possibly as much as 10%, primarily in protected areas. It retains the large majority of the roll-engraved naval engagement scene, probably around 80%+. The small areas of scene loss are due to a couple of patches of minor surface oxidation. 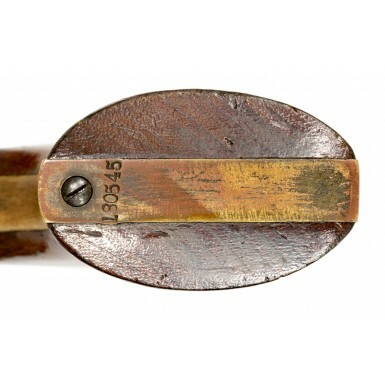 A similar small patch is present on the recoil shield on the reverse of the frame, suggesting that these areas developed while the revolver spent a long time laying on fabric. The COLT’S PATENT Nomarking and the last four digits of the serial number, 0545, remain extremely sharp and clear. 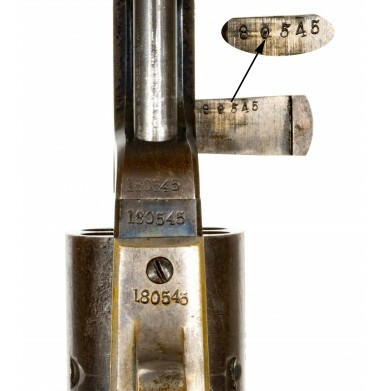 The front edge of the cylinder still retains the complete and fully legible marking: ENGAGED 16 MAY 1843. The rear of the cylinder retains none of the original stop pins, only the worn lumps showing where they originally were. The brass grip strap and triggerguard retain some strong traces of original silver plating, with the strongest on the triggerguard. The left rear web of the triggerguard has the usual 36 CALmarking. The exposed brass has a lovely, untouched patina that ranges from a rich golden butterscotch on the front strap to a deep ocher on the backstrap. The action of the pistol is excellent and remains very crisp. The revolver functions perfectly with fine timing, indexing and very tight lockup. 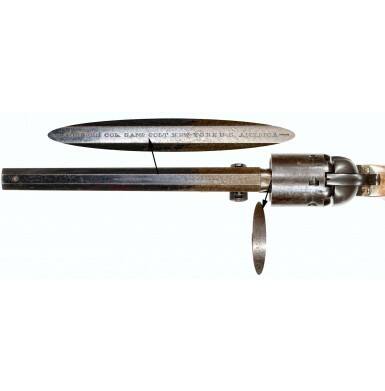 The reverse of the barrel web, forward of the cylinder, is stamped with a pair of standard London commercial proof marks, as would be expected on a pistol imported into England. Alternating London commercial proof and view marks are present on the rear edge of the cylinder between the chambers. The one-piece wood grip is in about FINEcondition as well. The grip retains most of its original varnished finish and is numbered to the gun in the gripstrap cut out on their interior. The left side of the grip shows a deeply stamped “circle-in a-circle” RSAF Enfield storekeepers’ cartouche that indicates that the pistol was inspected and received into British military service at Enfield. The exterior ring has a (CROWN)at the top, flanked by the letters Rand Mrespectively and with the word ENFIELDat the bottom of the ring. This almost certainly indicatesRoyal Manufactory at Enfield (Lock), also known as the Royal Small Arms Factory (RSAF). The center circle has a (CROWN) / GS / Min its center. The meaning of this second markings is not clear, and according to the numerous letters that Swayze sent to various officials in the British government, in the arsenal system and at Enfield, no consensus was reached as to what they mean. The stamp is so deeply struck it is almost hard to read, but only from the wood deformation that the stamp itself created. While the grip does show a number of scattered minor bumps, dings and marks from handling and service, it remains extremely crisp. 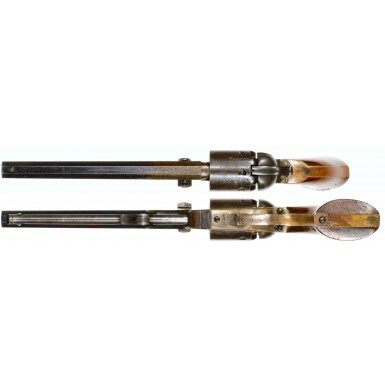 Overall this is a really fantastic condition example of an extremely scarce British military marked Colt Navy revolver. While the gun might have had a little more romance if it was purchased as part of the initial revolver order that saw Crimean War service, the fact that Civil War production pistols were purchased for emergency use by the British military is quite interesting. 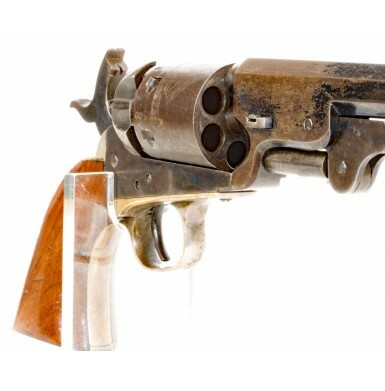 If Swayze’s research is correct and less than twenty of these revolvers are known to exist in the US, this could well be a great centerpiece to your 19thCentury Colt revolver collection. 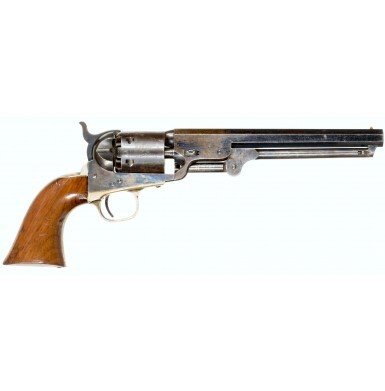 For the Colt Navy collector, this is an opportunity to own an extremely scarce British Martial Colt Navy and fill a hole in your Colt collection that you might not have the opportunity to fill again any time in the near future, particularly with a gun in such wonderfully crisp condition with so much original finish. 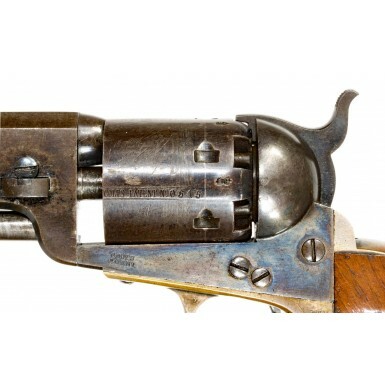 This is an extremely rare Colt M1851 Navy variant that would be a great addition to any advanced antique revolver collection. It is significantly rarer than a US Marital Colt Navy and for about the same amount of money (or slightly less) than an Army-Navy or Navy-Navy in the same condition!